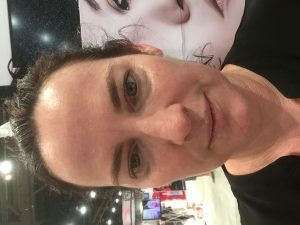 Why I love my ClearFX Skin microdermabrasion machine! I never learned how to use microdermabrasion in school, and for that reason I shied away from using it for a long time. I viewed it as being unnecessarily rough on the skin, and preferred to use chemical exfoliants instead. Right out of school I booth rented from a Cosmetologist / Grandfathered Esthetician, and she was in LOVE with microdermabrasion! I had a treatment with her, and was less than impressed. My skin was incredibly irritated, sore and RED! So so red…. So it was with much trepidation that I tried microdermabrasion again. I met Roy and Olga Revivo from ClearFX Skin at the Las Vegas show last year (June, 2015) and hesitantly tried my second microdermabrasion treatment there, and I was SO SURPRISED!! My face felt AMAZING! I had no redness or irritation whatsoever, and my skin felt so soft!!! As I was having my treatment Olga explained the entire time how the ClearFX Skin microdermabrasion machine was different from any other machine on the market today. To start with, the machine uses aluminum oxide crystals that are a much finer grit than those used in other machines. Aluminum oxide is an inert substance, meaning that it doesn’t cause any reactions on the skin. It is the second hardest material used in microdermabrasion, the hardest being diamond. Most aluminum oxide crystals that are used in microdermabrasion machines are 120 grit; The ClearFX Skin Microdermabrasion machine uses 180 grit. The higher the number, the finer the grit, and the gentler it is on the skin. As she was working on my face she was able to treat my eyelids and under my eyes. The suction is extremely easy to adjust, and I felt no pulling or tugging in those sensitive areas. In addition, I had absolutely NO crystals in my eyes, in my ears or in my mouth! The wand simultaneously deposits and suctions the crystals, so there is no ‘fly away’ residue. 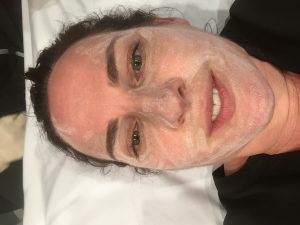 I was, and continue to be, very impressed with the system, and this was the start of my love affair with ClearFX Skin microdermabrasion machines! During my ClearFX Microdermabrasion machine treatment. Immediately following my ClearFX Microdermabrasion treatment. ClearFX Skin carries 5 different models of microdermabrasion machine, suitable for every skin care center, including medical practices. Their least expensive model is the ClearFX Skin Diamond Oxy-peel. The Diamond Oxy-peel combines the benefits of a diamond peel with the added Oxy-system. Combining these two treatments into one powerful system allows you to quickly and easily refine, rejuvenate and enhance your clients’ skin. The 4 following models include a free diamond kit to quickly transform your crystal machine to a diamond machine! The CFX1000 is an esthetic grade microdermabrasion machine that uses fine grit aluminum oxide crystals to gently resurface the top layer of the skin. At the same time suction gently and effectively removes the dead skin cells and crystals, resulting in softer, smoother skin. The entire treatment is extremely comfortable, with no pain, side effects, redness or downtime. The CFX1000 Oxy comes complete with the same features found in the CFX1000 model along with the built-in facial breeze system. The facial breeze system sprays a fine mist of oxygen molecules, amino acids, and a blend of vitamins and minerals to soothe and calm the skin. You can also use the facial breeze system after any service that creates heat and irritation on the skin, such as waxing, peels, dermaplaning and microneedling. In the case of microneedling, I would suggest only using distilled water in the oxygen mist sprayer to avoid any adverse reactions. The CFX2000 is a medical grade system with a medical grade motor, which is stronger than the esthetic grade microdermabrasion machines. 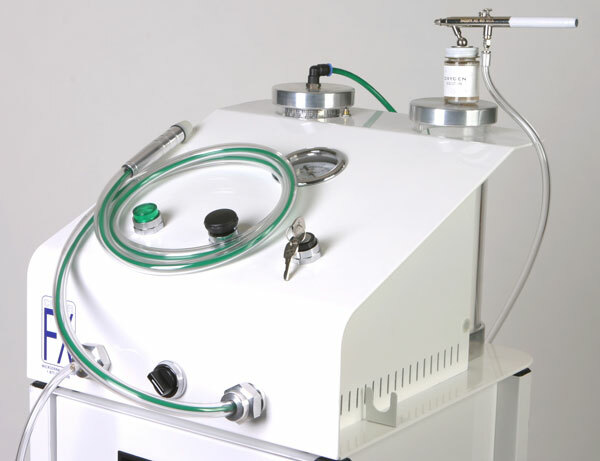 This system was designed with Dermatologists for use by professionals. The ClearFX Skin 2000 allows you to rejuvenate, soften and smooth your clients’ skin by polishing the skin with aluminum oxide crystals, while simultaneously suctioning all of the dead cells and impurities. Results are immediate with no pain, side EFFECTS, redness, or downtime — GUARANTEED! The inclusion of the medical grade motor allows you to bill insurance for this treatment. The CFX5000 system comes complete with the same features found in the ClearFX 2000 model, along with the built in facial breeze system. The facial breeze system sprays a fine mist of oxygen molecules, amino acids, and a blend of vitamins and minerals to soothe and calm the skin. You can also use the facial breeze system after any service that creates heat and irritation on the skin, such as waxing, peels, dermaplaning and microneedling. In the case of use after microneedling, I would suggest only using distilled water in the oxygen mist sprayer to avoid any adverse reactions. As with the CFX2000 machine, the inclusion of the medical grade motor allows you to bill insurance for this treatment.